Jamie Whincup topped Practice 2 for the ITM Auckland SuperSprint, as Supercars Championship leader Scott McLaughlin came unstuck. Whincup took his Red Bull Holden Racing Team Commodore to a 1:02.6575s lap of Pukekohe, to finish 0.0962 seconds clear of David Reynolds. 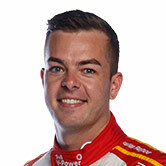 McLaughlin, though, missed the bulk of the 40-minute session, which his title rival Shane van Gisbergen finished eighth. After setting the pace on Friday morning, McLaughlin crashed at Turn 3, three minutes in. Having set an initial flying lap, he locked a front brake in his Shell Ford between Turns 2 and 3 after landing on the kerb, firing into the outside tyres. "Just trying to find a little bit more of a driving thing that I've been working on into there, I just overstepped the mark, completely my fault," McLaughlin said. "Sorry to everyone at Shell V-Power Racing, I've given them a whole lot of work that they didn't need, I'll give myself a good kick up the arse and come back tomorrow. "We've been locking into there all run, so I've been running a little bit more brake bias since the start of that session. "I just lost the rear braking into 2 there, lost it and it was gone, passenger." The session was red-flagged again inside the opening 10 minutes, when Andre Heimgartner's Nissan stopped at pit entry. After an interrupted first half, Nick Percat led the way with a 1:03.2487s, 0.0098s clear of Scott Pye, followed by Whincup, Fabian Coulthard and van Gisbergen. Percat's benchmark in the Coregas NZ Commodore stood into the final eight minutes, when running resumed after a third red-flag period. Todd Hazelwood had fired off at Turn 1 in the Bigmate Racing Commodore but managed to wash off enough speed before getting to the tyre wall and avoided major damage. Whincup jumped to the top with a 1:03.1316s straight after the restart but was quickly pipped by a 1:03.1316s for Tim Blanchard. James Courtney, Rick Kelly and Reynolds had brief spells at the top in a frantic finish, before Whincup fired in the definitive 1:02.6575s. 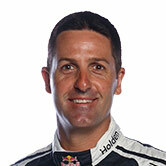 "We had a programme, and we stuck to it," Whincup, in Triple Eight's prototype ZB this weekend, said. "It wasn't that eventful for us. We just got through out plan, did our thing, and the car is pretty quick. "I haven't driven this car before, so it took a bit of time to get used to it. But now it feels like home. "We pride ourselves on engineering excellence, but you can just feel little differences here and there. "Just positions of everything, how the steering rack reacts, how the car reacts over the bumps, the gearstick feels a bit different. "And around this place you need to be at home, you need to be at one with the car. "I was a bit timid at the start, because you can easily have big off here, but now I feel at home." 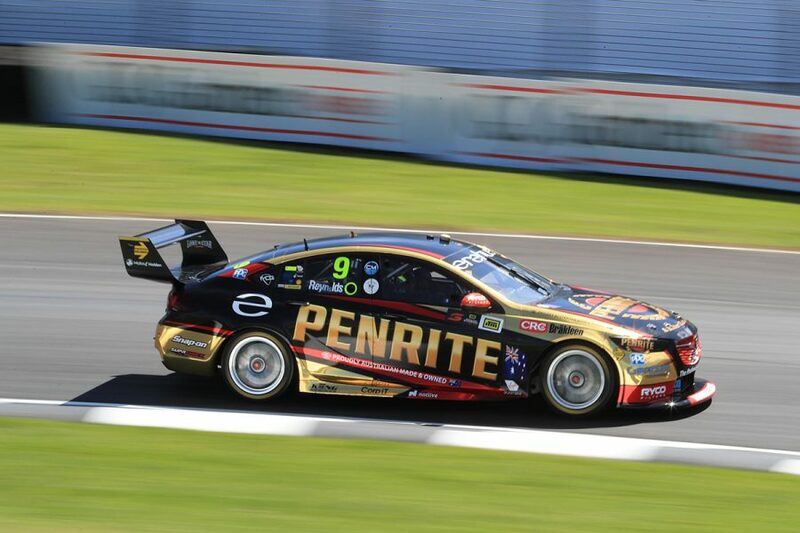 Reynolds wound up second, 0.0962s adrift, while Tickford pair Mark Winterbottom – in his penultimate event with the team – and Chaz Mostert leapt from 18th and 11th to third and fourth. Pye and the lead Nissan of Kelly were next, ahead of top rookie Richie Stanaway in another Tickford Falcon. 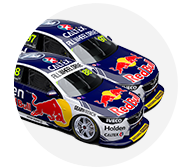 Van Gisbergen was eighth, 0.3644s off the benchmark set by his team-mate, while Craig Lowndes and Tim Slade rounded out the top 10. Courtney and Blanchard wound up 11th and 12th, and Percat 16th, after tagging the Turn 4 wall in the closing stages. 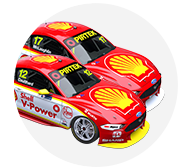 The Shell Fords of Coulthard and McLaughlin were 14th and 24th, with Heimgartner 20th and Hazelwood 26th. The ITM Auckland SuperSprint continues on Saturday, with Practice 3 at 10:25am local time followed by ARMOR ALL Qualifying and the weekend's opening 70-lap race.